Looking for a way to make your night out even more amazing? For selected City National Grove of Anaheim concerts, the purchase of our City National Bank Crystal Package entitles you to Tier One premium seating, access to the beautiful City National Bank Crystal Lounge and VIP parking. Please call the City National Grove of Anaheim Box Office at 714.712.2700 for ticket availability. City National Bank cardholders can also access the Crystal Lounge by showing any City National Bank credit or debit card with their tickets at the private VIP Crystal Lounge entrance located next to the box office. The City National Bank Crystal Lounge features a private bar, private VIP entrance, flat screen monitors and spacious accommodations for entertaining. It’s the perfect accent to a special evening out. For selected City National Grove of Anaheim concerts, we offer the unique opportunity to enjoy dinner and the show without leaving your table. We offer a three course prix fixe dinner which includes a crisp salad, three delicious entree options, and a tasty dessert. 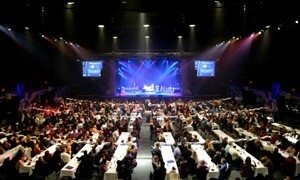 For more information on dining at the venue, please call the Box Office at 714.712.2700.